ALLEGAN, Mich., Dec. 3, 2018 /PRNewswire/ -- While the holidays are synonymous with peace, love and joy for many Americans who celebrate, the holiday season is actually filled with physical and emotional discomfort, according to a new survey commissioned by the distributor of store brand Omeprazole Delayed Release Orally Disintegrating Tablets 20 mg (Omeprazole ODT). The national "Beating the Holiday Burn" survey of 2,000 Americans 18 and older* found that, from stress to overeating, heartburn triggers abound during the season. In fact, 88 percent of Americans feel stressed when celebrating the holidays. However, while frequent heartburn is treatable, it may prove more difficult to avoid the triggers. "It's no secret that our ever-growing to-do lists, disagreements with loved ones and the pressure we place on ourselves to make the holidays great can all heighten stress and cause us to overeat—both triggers for heartburn," explains family therapist and author, Tom Kersting. "Small changes like meditation, lowering our overall expectations, keeping Omeprazole ODT on hand and removing unnecessary items from our checklist can go a long way in alleviating the strain and allowing us to enjoy the season, and its foods, to the fullest." Holiday stress seeps into many aspects of the season, with five top stressors including purchasing presents (39 percent), how much to spend (38 percent), cooking holiday dinner (30 percent), prepping the house for guests (28 percent) and cleaning before and after gatherings (27 percent). Moreover, nearly half of Americans (47 percent) report being filled with dread when thinking of the money they'll spend around the holidays. The survey also found that more than fifteen percent of Americans admit that participating in conversation with family and friends stresses them out. That's likely because topics such as politics (68 percent), religion (24 percent) and money (23 percent) typically cause arguments at the holiday dinner table. In fact, the high stress of the season can cause squabbles left and right. The average couple will engage in at least seven arguments over the course of the holiday season. Where to spend the holidays (35 percent), how much money to spend to spend on gifts (31 percent) and who cleans up (26 percent) are among the most likely to cause friction during the holidays. Moreover, more than one in ten respondents have argued over a family member checking emails (12 percent), whether to get a real or fake tree (13 percent), who the designated driver will be (10 percent) or someone picking at the food before it's ready (10 percent). Anxiety and arguments aren't the only thing wreaking havoc on our wellbeing over the holidays. In fact, when it comes to the foods at the holiday table, many Americans are feeling physical discomfort. A whopping 85 percent of Americans admit to overeating during the holidays, with nearly two thirds (61 percent) feeling physically uncomfortable after eating a holiday meal. More than forty percent of Americans (42 percent) unbutton their pants after a holiday meal. Nearly half of respondents (49 percent) confess they choose their holiday clothing based on what they plan on eating, with loose-fitting clothes (54 percent) and stretchy pants (39 percent) among the most popular fashion choices. "From overeating to stressful activities, it's no surprise that the holiday season can trigger heartburn," said Michael Bachman, Marketing Director at Perrigo. "Luckily for frequent heartburn sufferers, store brand Omeprazole ODT is the first-of-its-kind dosage form. Our holiday gift to heartburn sufferers is a melt-in-your-mouth, more enjoyable way to treat your heartburn. Get back to enjoying the most wonderful time of year with a side of cranberry sauce, not heartburn." 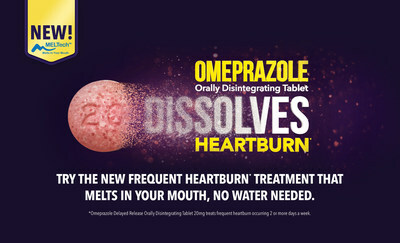 Store brand Omeprazole ODT** is the first and only orally disintegrating dosage form of omeprazole, the #1 selling*** PPI ingredient in heartburn treatment, available for people suffering from frequent heartburn****. Omeprazole ODT with MELTech™ technology is a FDA-approved medication that dissolves in the mouth without water. Consumers can find store brand Omeprazole ODT† at food, drug and mass retailers nationwide under each store's Own Brand label. For more information, visit http://www.DissolveYourHeartBurn.com. The "Beating the Holiday Burn" survey was conducted by OnePoll on behalf of Perrigo Company plc between October 10 and October 15, 2018, among 2,000 nationally representative Americans ages 18 and older, using an e-mail invitation and an online survey.